The Teranet-National Bank House Price Index of Canadian home prices for August was released this morning. On a national level, the index rose 0.14% MoM at an annual rate; higher, but just barely. August’s YoY growth came in at 1.36%, its lowest level since November 2009. While this may sound bad, the low year over year growth reading is a result of last August’s peak in the index; base effects are now weighing more than high frequency changes. Of the 11 metropolitan areas that make up the composite, Montreal saw the greatest gains of 10.64% MoM annualized, followed by Hamilton and Ottawa with 9.91% and 8.70%, respectively. Conversely, Vancouver experienced the greatest decline of 4.20%, with Calgary not far behind, down 4.13%. 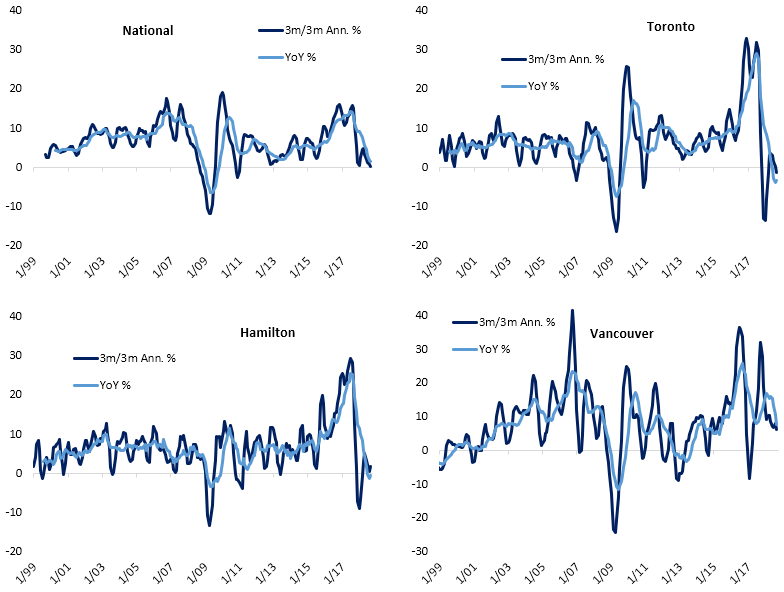 In the past year and a half, Toronto—the largest of the 11 metros—and Hamilton have seen significant declines in YoY growth. The August reading, while still negative, was the first sequential increase in YoY change for the cities since May 2017. Prices have climbed in Canada for some time now, bringing to question an affordability problem or a housing bubble. The repercussions of rising rates, local policy reforms, and higher lending standards nationally are starting to weigh on home prices. Overall from this report, the Canadian housing market is a mixed bag; not necessarily showing strength or weakness on a national level. While the two largest index contributors, Toronto and Vancouver, have seen modest and great MoM declines, other areas of the country like Montreal—the third largest area—have seen strong growth. Nationally, home prices are clinging to positive territory on both a YoY and 3m/3m annualized rate. While they may avoid declines, it’s pretty clear that the double-digit annual rate of advance we’ve seen in Canada for years is not coming back.